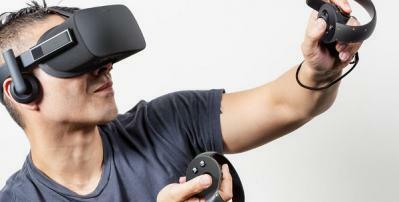 Oculus VR finally unveiled their first commercial/consumer VR HMD, the Oculus Rift which will be released in 2016. The Rift will use two 1080x1200 AMOLED displays to reach a total resolution of 2160x1200. Those AMOLEDs are produced by Samsung. Oculus VR released several development-kits and prototypes in past years, with different displays. The first one used an LCD, but in the 2nd-gen HMD they adopted a low-persistence AMOLED display - in fact that was the same Super AMOLED display used in the Galaxy Note 3 (complete with the touch layer and all). Later on they switched to a dual-AMOLED design.